Free agency is currently in full swing as the 49ers added outside linebacker/defensive end/pass rush specialist Dee Ford to the 2019 roster. They've addressed the position with a long term contract but should be looking to add a second pass rusher in the draft. One who could fit the mold is the University of Kentucky's Josh Allen. In his senior year at Kentucky, Allen posted 17 sacks and 21.5 tackles for losses. He did all that despite playing a fair amount of coverage snaps as an outside linebacker on obvious passing situations, which makes his performances that much more impressive. Per Pro Football Focus' 2019 draft guide, Allen logged 244 pass rush snaps and earned its highest pass rush productivity rate with 30.3% of his snaps generating pressure (17 sacks, 12 hits, and 28 hurries) for 54 total pressure snaps. He comes in as the fifth best overall draft prospect on the Pro Football Focus NFL draft board. Per The Draft Network, Allen doesn't crack the top 5 among its most recent big boards, instead ranking sixth, seventh, seventh, eighth, and ninth. Still not bad and the overall consensus is that Allen is a top 10 player in the draft. It's easy to see why. The first thing that sticks out about Allen is his size. At the recent NFL Combine, Allen measured in at 6-foot-5 and 262lbs. The University of Kentucky football site listed him at an almost identical weight, suggesting this is probably a good indication of his playing weight during the season. An edge rusher at that height and weight who can move like he does here on this sack against Central Michigan last season is remarkable. Allen beats the left tackle with a simple speed rush, swatting away the blocker's hands and bending around the edge. The tackle grabs the back of his jersey and Allen stumbles a bit but he keeps his balance, flushes the quarterback from the pocket and catches him from behind for the sack. But since this is only sacks, lets take a look at them. Josh Allen is #41. I took a longer look at his sacks in the Twitter thread above. Speaking of speed, Josh Allen has plenty of it and he utilizes it effectively and efficiently to beat offensive linemen off the edge. 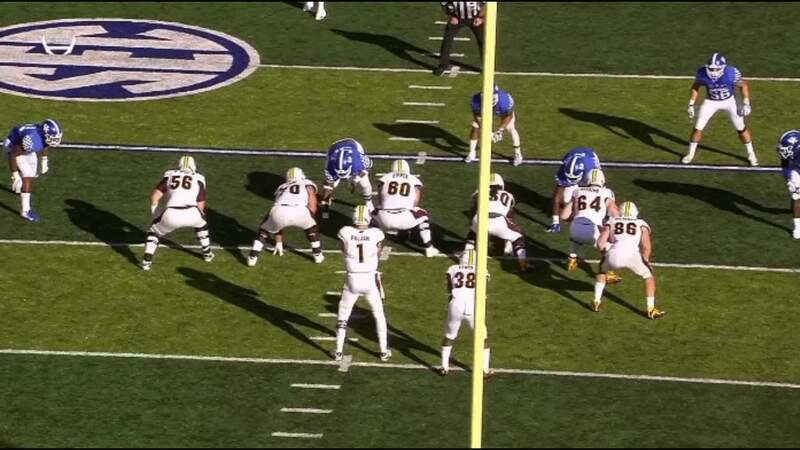 Working against the Mississippi State left tackle here, Allen, in a two-point stance, gets a good jump off the snap and displays the speed and bend around the edge to get the sack. The tackle drops into a vertical pass set but isn't fast enough to meet the speedier Allen at the point of attack for his block. Allen dips under the block and bends the edge before sacking the quarterback. Allen doesn't have many pass rush moves but the ones he does have he uses to great effect. Allen's strength is best utilized while "ripping" through the blocker. The "dip and rip" technique allows a defender to keep his body compact with a low center of gravity, creating a stronger power position and allowing the defender to keep his balance while "running the arc." 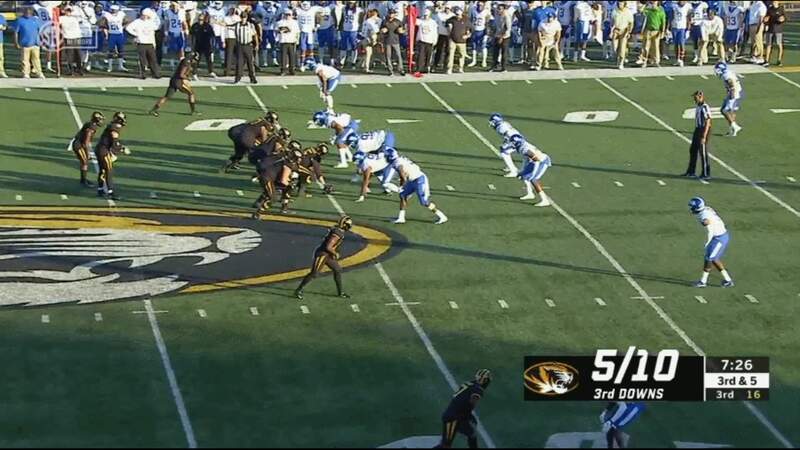 Against the Missouri right tackle, Allen demonstrates an effective dip and rip technique, drives through the blocker into the backfield, and forces the strip sack. Allen engages the blocker by establishing a half-man relationship before ripping through the blocker. He gets to the quarterback in time to force a strip sack. 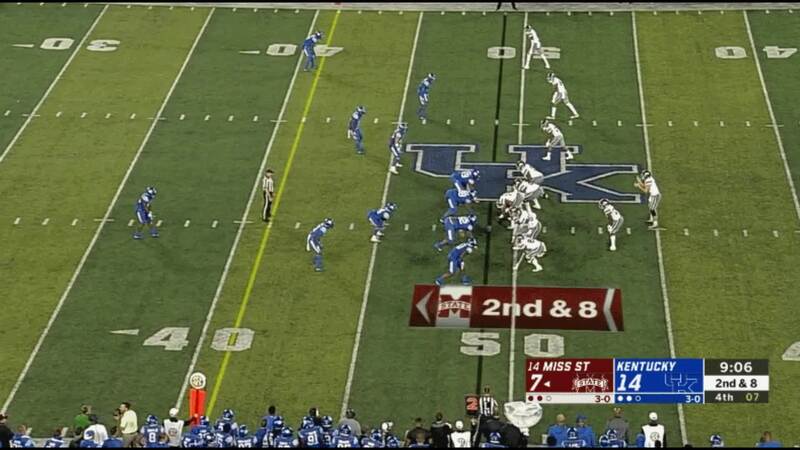 Allen does the same thing here against Tennessee. 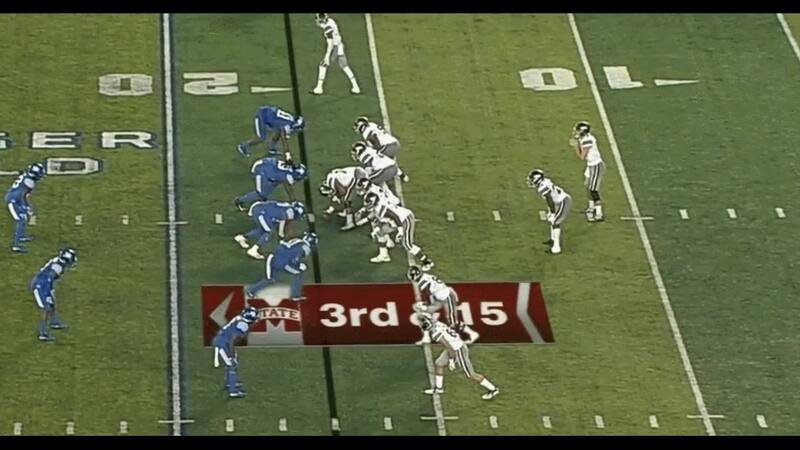 On his get-off, he gives a quick head nod to the B-gap before cutting back out around the tackle. Allen's head fake establishes the half-man relationship where he then wins with a rip move around the edge to get the sack. An effective edge rusher needs to be able to also know when to take the inside track to the quarterback. 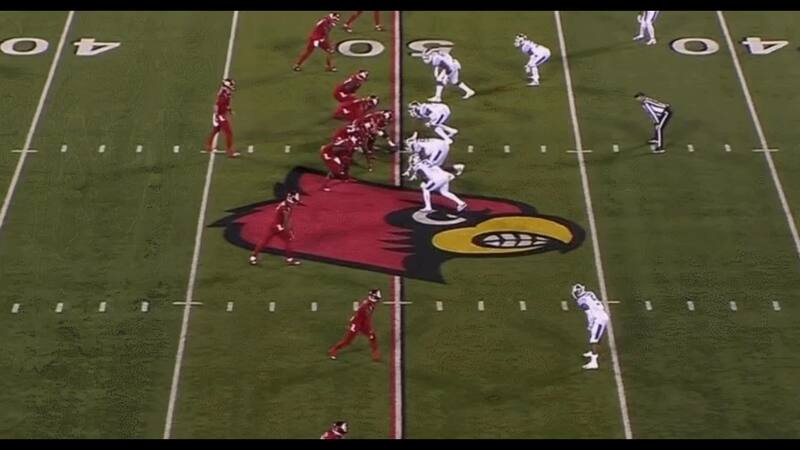 Allen can also be an effective pass rusher when squeezing the B-gap. 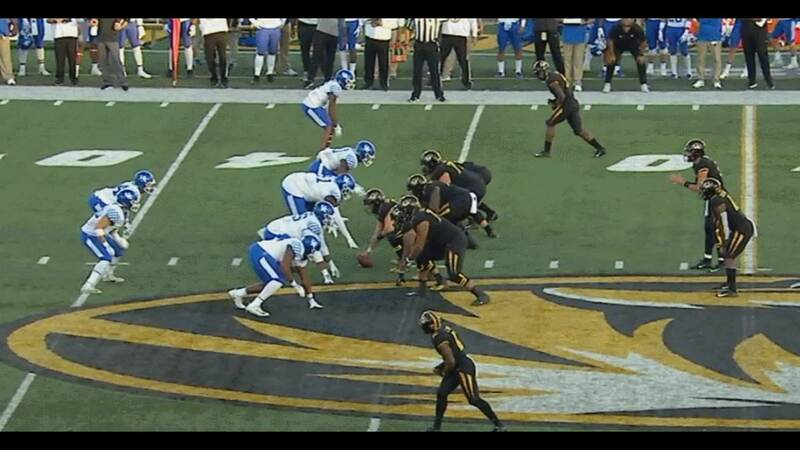 Against Missouri, Allen uses a "swat and swim" to beat the left tackle to the inside. 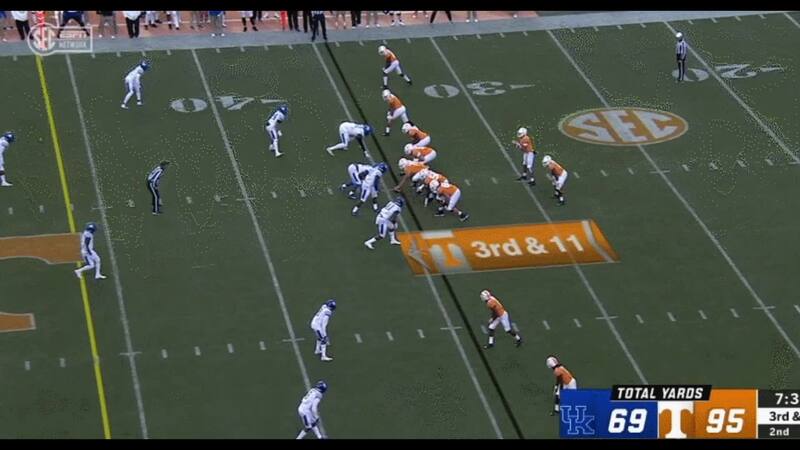 It's tough to tell from the angle, but Allen is either in a 5- or 6-technique defensive end position. The tight end barely chips him as he comes across Allen's face and Allen squeezes into the B-gap and defeats the tackle by swatting his hands away as he makes contact. As he did so often, he causes the fumble and strip sack. His play strength is also superior on the pass rush. Against Louisville, Allen loops around on a TEX stunt (tackle-exchange stunt) and bull-rushes the guard into the backfield to make the sack. Allen also forced 11 fumbles in his time at Kentucky, five of them coming in 2018. 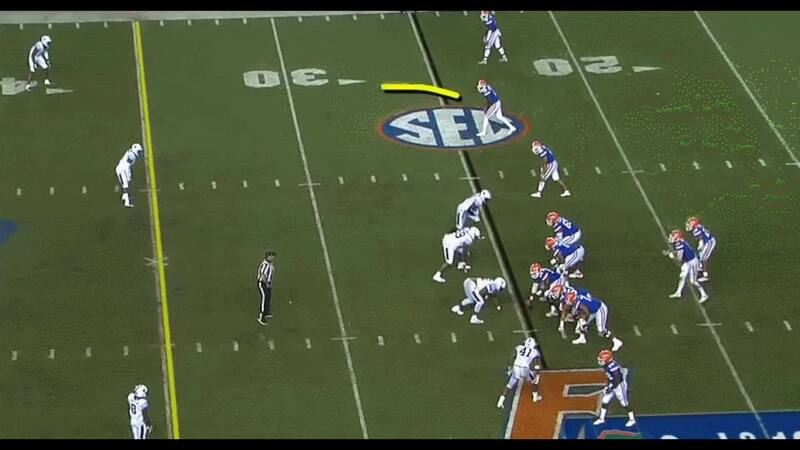 Against Florida, Allen is to the left in this end zone angle in a wide-9 defensive line technique. 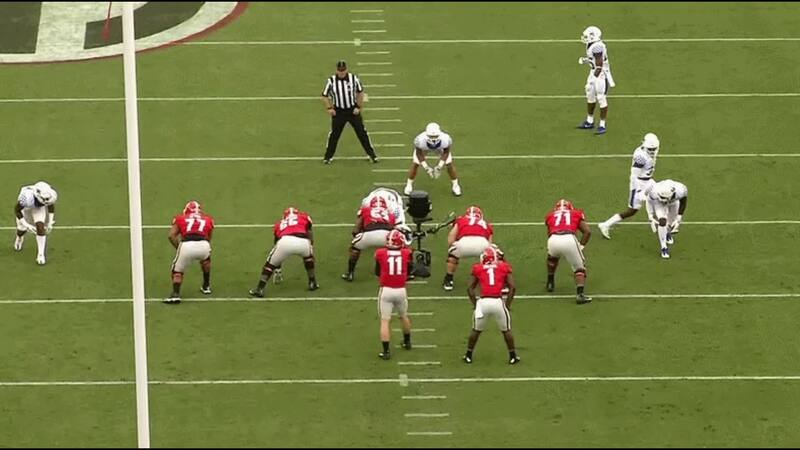 The wide-9 is perfect for a pass rusher like Allen with the size and speed he plays with. He uses that speed to beat the left tackle around the edge. A pass rusher won't always be able to wrap up the quarterback for a tackle but Allen displays the awareness to know that in this situation, it may be more effective to try to knock the ball out of the quarterback's hand as he's getting ready to throw. Allen causes the strip sack here, effectively sealing the game for the Wildcats. Allen knocks the ball loose here as well for another strip sack. Instead of just going for the tackle, Allen chops down on the quarterback's arm to pry the ball loose, demonstrating the sheer physical strength he brings to any defensive front. While any team that lands Allen would certainly improve its pass rush, there are a couple areas of concern in his body of work that he'll need to improve on in his first couple of seasons. One issue with his skill set is he has no effective counter moves other than a speed rush or a rip move. Elite pass rushers are known for having a variety of moves beyond just pure speed off the edge and one or two arm techniques. Allen lacks a consistent bull rush and doesn't display any other moves such as a long arm or an effective swim move. 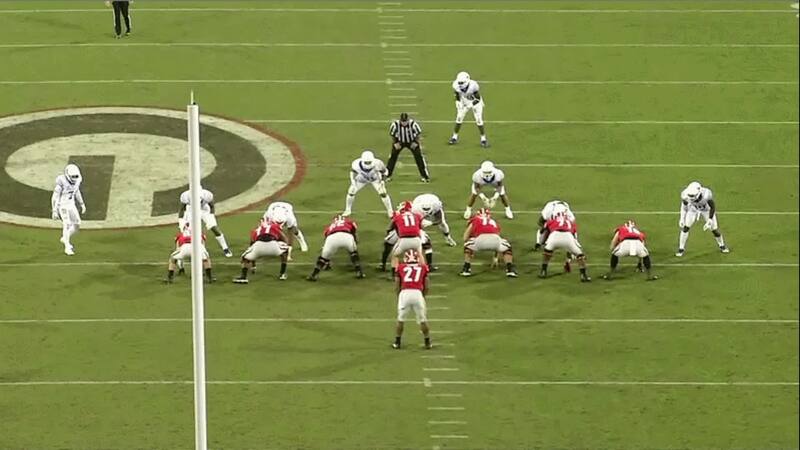 As a result, if he doesn't get a good jump off the snap, he often will not be able to move the lineman in front of him. Allen tries to swim over the top of the right tackle here and as a result, exposes his upper body to being controlled by the blocker. Since he does not have an effective swim move, he's unable to get around the blocker and is not in a good power position to bend around the edge. 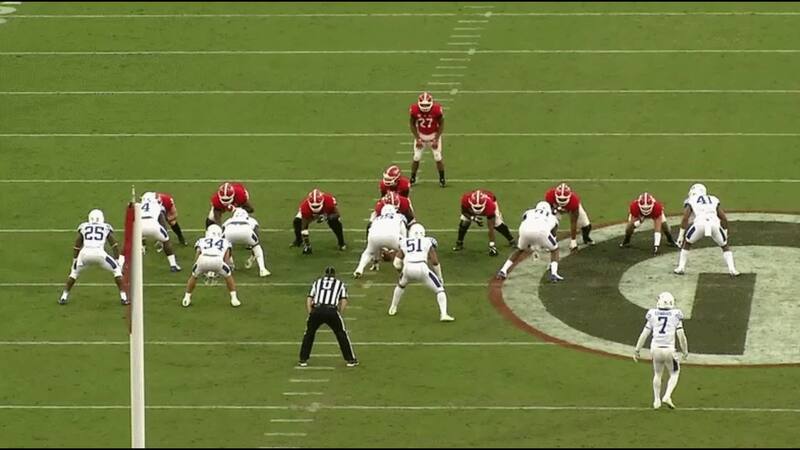 Against NFL-caliber tackles, this is an even bigger issue, as you can see above with Allen going against NFL left tackle Isaiah Wynn and prospect Andrew Thomas. Any counter moves he tries to initiate open him up to being easily controlled at the point of attack by the blocker. But the most glaring flaws in this regard come when he has to take on a smaller, lighter tight end that cannot manipulate with his strength. In pass or run, Allen frequently struggled in his rush and run defense against smaller tight ends. He doesn't effectively utilize his play strength or athleticism and looks clunky and stiff rushing off the edge. Another issue is missed tackles. He's not particularly strong in the run game when he has to shed blockers (as noted above) but often when he does get a chance to make play, he loses form, breaks contain, and takes himself right out of the play. 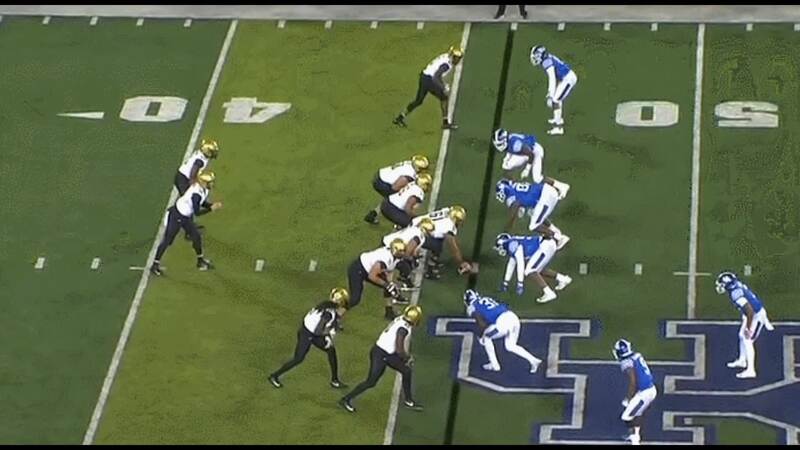 In the above tweet, you can see a longer thread I did on Josh Allen in the running game. Overall, Allen is an intriguing prospect who any team would be lucky to have as a pass rusher in a league that favors passing over anything else. He needs to develop a greater toolbox of pass rushing moves if he truly wants to be one of the league's elite rushers. Any team that drafts him and relegates him to a strictly pass rushing role is doing him a disservice as he has the versatility to drop into coverage as well and is an effective pass defender from the hash to sideline (didn't cover his coverage snaps here, would've been too long). Allen would likely find a home in the 49ers defense as the strong side end or SAM linebacker. In pass rushing situations, he could slot over to LEO or he can drop into coverage. As a pass rusher, he'd be effective rushing from the new wide-9 defensive front the 49ers are likely to employ this season, which would be a good use of his speed off the edge. They shouldn't draft him now with the recent trade for outside linebacker Dee Ford, who in my own opinion is the same type of speed rushing end you'd want in a wide-9 front. If they do, they shouldn't use the number two pick on him and instead should consider him in a trade back. Unfortunately, Allen will likely go in the top 6 or 7. Wherever he lands in the NFL, he will be called upon to make an immediate impact and I think in many ways he will if he improves upon the above issues. He's certainly going to be a fun player to watch regardless. UPDATE as of 3pm Thursday March 21: Per Matt Maiocco, the 49ers did not make the short trip to the University of Kentucky to meet with Josh Allen after meeting with Ohio State defensive end Nick Bosa and Alabama defensive tackle Quinnen Williams. It's a safe bet that the 49ers are off Allen completely, and didn't seem too thrilled that he sat out the senior bowl where they wanted to see him work, praising players "who had the courage to come out and play this game." Of course, last year no one knew the 49ers were high on Mike McGlinchey but that could've been for other reasons like preventing a Raiders trade up to take him over Kolton Miller. No one knows for sure what's going to happen but it appears Bosa and Williams sit atop the 49ers draft board. Comment: No way this guy should be considered at #2. i keep telling people to watch his full games NOT the highlights. The negatives outweigh the positives by a lot and you dont draft a project in the top 5. Comment: If you are drafting second, I think you should have a higher target than a top 10 player on the big boards. Bosa, Q or trade down.